Giving flowers is a classic and timeless way of showing someone you care. They are the embodiment of a gesture, message, a willingness to help distribute the beauty of the world and make sure that someone special personally receives some. Whether it’s a reaffirmation of warm feelings or an initial, dramatic declaration of love, flowers are without a doubt the coyest and yet clear way to convey a message. Indeed, recent research has shown that those who send flowers, in comparison to other gifts, are viewed as successful, caring and emotionally intelligent people. It’s not hard to make the decision to send blossoms – what is hard, is what kind to send. 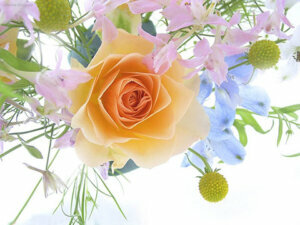 Cross-culturally and over many millennium, flowers have carried many meanings. Read this list and consult a florist shop to make sure you send the right message. Tulips and their bulbs are heavy with meaning, especially in Holland. In the 17th Century, tulip bulbs were more valuable than gold! The flower symbolized immortality, life, and love. Tulip mania continued in the 1630’s when a frenzy for the flowers occurred, and they became so expense that they were treated as currency. These classic blossoms have a different meaning depending on what color they are, so be careful not to get them mixed up! Red recantations symbolize deep love, while white represents pure love. Yellow represents dejection – so unless you are going for such a message, be careful of your choice. The elegant, bell-shaped calla lily traditionally symbolizes magnificence and beauty. The white variety is associated with purity and innocence, so combinations of different types make for amazing wedding bouquets, or when choosing a corsage. Daffodils symbolize regard and chivalry, as well as signifying new beginnings and rebirth. After all, they are among the first flowers to bloom in early spring. Lilacs may be a good flower to place in your child’s room, because they symbolize youthful innocence and confidence, and also have a lovely aroma that will waft into your wee one’s dreams and help them to relax. The choices at the florist shop might be overwhelming at first – try browsing their selection with the florist online first, before going in. Make sure your spring bouquets means everything you want it to.